Instructions for questions 1 and 2: Analyse the following passage and provide an appropriate answer for the questions that follow. (1) it allowed the employment of surplus labour in a nation. (2) it allowed the diversion of labour to export oriented industries. (3) it allowed the deeper specialisation of the same labour force. (4) it allowed varied application of labour force in a nation. (5) it allowed application of varied labour force in a nation. (1) mutual increases in riches and commerce. (2) emulation of industrial activity by different nations. (3) affable promotion of industrial activity among nations. (4) productive employment of labour in different nations. (5) higher wages received by labour in exporting nations. Instructions for questions 3 – 5: Identify the correct sentences from the options given below. (1) When kite flying you can always tell when you lose a kite because the string feels loose. (2) When kite flying you can always tell when you loose a kite because the string feels lose. (3) When kite flying you can always tell when you loose a kite because the string feels loose. (4) When flying a kite, you can, always tell when you lose a kite because the string feels lose. (5) While flying a kite, you can always tell if you lost a kite when the string felt lose. (1) If XAT aspirants had not taken so long checking each question before attempting the next question they might not have run out of time. (2) If XAT aspirants had taken so long checking each question before attempting the next question they might not have run out of time. (3) Had XAT aspirants not took so long checking every question before attempting the next question they might not have run out of time. (4) If XAT aspirants had took so long checking each and every question before attempting the next question they might not have run out of time. (5) Had XAT aspirants not taken so long checking all questions before attempting the next question they might not have run out of time. (1) The news channel agreed to report that next Sunday the couple had been married for 10 years. (2) The news channel agreed to report that next Sunday the couple will have been married for 10 years. (3) The news channel agreed to report that next Sunday the couple will be married for 10 years. (4) The news channel agreed to report that next Sunday the couple could have been married for 10 years. (5) The news channel agreed to report that next Sunday the couple has been married since 10 years. Instructions for questions 6 and 7: Answer the following questions based on the information given below. 6. Which one of the following, if true, most substantially strengthens the idea given in the passage? (1) The percentage of people in a given ashram practicing Raja Yoga is more than the percentage of people practicing Hatha Yoga. (2) The number of people in a given ashram practicing Raja Yoga is more that the number of people practicing Hatha Yoga. (3) The number of Yoga schools teaching Raja Yoga is more than the number of Yoga schools teaching Hatha Yoga. (4) The number of teachers teaching Raja Yoga is more than the number of teachers teaching Hatha Yoga. (5) The percentage of students who have successfully learnt Raja Yoga is more than the percentage of students who have successfully learnt Hatha Yoga. 7. Which of the following option best reflects Shankaracharya’s comments on Hatha Yoga? (1) Hatha Yoga is for those whose worldly desires are not placated. (2) Hatha Yoga has disastrous consequences for Yoga practitioners. (3) Practiced under the guidance of experts, Hatha Yoga is better than Raja Yoga for some people. (4) Raja Yoga gives better results and in a shorter time period for most people, and therefore it should be encouraged. (5) Hatha Yoga is ill-suited for people with strong worldly desires. Instructions for questions 8 – 10: Analyse the following passage and provide an appropriate answer for the questions that follow. The greens’ success has clear policy implications, especially on issues of nuclear power, ecological tax reform, and citizenship rights. But success also has implications for parties themselves. Greens have always faced a unique ‘strategic conundrum’ arising from their unique beliefs and movement roots. Put simply, how can they reconcile their radical alternative politics with participation in mainstream or ‘grey’ parliamentary and government structures? Throughout the 1990s most parties shed their radical cloth in an attempt to capture votes, even at the expense of party unity and purity. Most were rewarded with electoral success well beyond what had been imaginable in the 1980s. The price to pay has been tortured internal debates about strategy, and new questions about green party identity and purpose. Today the key questions facing green parties revolve around not whether to embrace power, but what to do with it. More specifically, green parties face three new challenges in the new millennium: first, how to carve out a policy niche as established parties and governments become wiser to green demands, and as green concerns themselves appear more mainstream. Second, how to take green ideas beyond the confines of rich industrialised states into Eastern Europe and the developing world where green parties remain marginal and environmental problems acute. Third, how to ensure that the broader role of green parties- as consciousness raisers, agitators, conscience of parliament and politics- is not sacrificed on the altar of electoral success. Green parties have come a long way since their emergence and development in the 1970s and 1980s. They have become established players able to shape party competition, government formation, and government policy. But this very ‘establishment’ carries risk for a party whose core values and identities depend mightily on their ability to challenge the conventional order, to agitate and to annoy. For most green parties, the greatest fear is not electoral decline so much as the prospect of becoming a party with parliamentary platform, ministerial voice, but nothing new to say. 8. Which out of the following is closest in meaning to the first of three challenges mentioned in the paragraph? (1) Niche of green parties is being eroded by mainstream parties. (2) Green parties are finding it difficult to find new strategy. (3) Green parties have become stronger over a period of time. (4) Some green parties are becoming grey. (5) Non green parties are becoming less relevant than green parties. 9. Which of the following is the most important point that author highlights? (1) Challenges before green parties to change their strategy from green activism to green governance. (2) How should green parties win confidence and support of governments? (3) Transformation of green parties in recent decades. (4) Green movement is not strong in developing countries. 10. How best can mainstream political parties, in India, keep green parties at bay? (1) By imposing a green tax. (2) By allowing carbon trading. (3) By including green agenda in their governance. (4) By hiring Al Gore, the Nobel prize winner, as an ambassador. (5) By not letting green parties fight elections. Instructions for questions 11 – 13: Answer the following questions based on the information given below. (i.e., the general role of natural language in the evolution or development of human intellectual functioning), and a functional- or discourse-level concern with how using any given language code in a particular way might influence thinking (i.e., the impact of special discursive practices such as schooling and literacy on formal thought). Although analytically distinct, the three issues are intimately related in both theory and practice. For example, claims about linguistic relativity depend on understanding the general psychological mechanisms linking language to thinking, and on understanding the diverse uses of speech in discourse to accomplish acts of descriptive reference. Hence, the relation of particular linguistic structures to patterns of thinking forms only one part of the broader ray of questions about the significance of language for thought. Proposals of linguistic relativity necessarily develop two linked claims among the key terms of the hypothesis (i.e., language, thought, and reality). First, languages differ significantly in their interpretations of experienced reality- both what they select for representation and how they arrange it. Second, language interpretations have influences on thought about reality more generally- whether at the individual or cultural level. Claims for linguistic relativity thus require both articulating the contrasting interpretations of reality latent in the structures of different languages, and accessing their broader influences on, or relationships to, the cognitive interpretation of reality. 11. Which of the following conclusions can be derived based on Sapir-Whorf hypothesis? (1) Americans and Indians would have similar intelligence. (2) South Indians and North Indians would have similar intelligence. (3) Those with same intelligence would speak the same language. (4) Those with similar intelligence may speak the same language. (5) Structure of language does not affect cognition. 12. If Sapir-Whorf hypothesis were to be true, which of the following conclusions would logically follow? 1. To develop vernacular languages, government should promote public debates and discourses. 2. Promote vernacular languages as medium of instruction in schools. 3. Cognitive and cultural realities are related. 13. Which of the following proverbs may be false, if above passage were to be right? 1. If speech is silver, silence is gold. 2. When you have spoken a word, it reigns over you. When it is unspoken you reign over it. 3. Speech of yourself ought to be seldom and well chosen. Instructions for questions 14 – 17: Analyse the following passage and provide an appropriate answer for the questions that follow. Demography of organisations, also called population ecology is an interesting field. It proposes that organisational mortality processes depend upon the age and size of the organisation, as well as on characteristics of populations and environments. Moreover, there is evidence of an imprinting process – meaning that environmental conditions at certain early phases in an organisation’s development have long-term consequences. In particular, organisations subject to intense competition have elevated mortality hazards at all ages. A central theme is structural inertia, the tendency for organisations to respond slowly relative to the speed of environmental change. A central argument holds that the inertia derives from the very characteristics that make organisations favoured actors in modern society in terms of reliability and (formal) accountability. It follows that changes in an organisation’s core features are disruptive and increase mortality hazards, at least in the short-run. Research on this subject tends to support this view. The concept of niche provides a framework of relative environmental variations and competition to population dynamics and segmentation. Much empirical work examines the niches of organisational populations in terms of dimensions of social, political, and economic environments. Most research in this field builds on theories of resource partition and of density dependence. Resource-partitioning theory concerns the relationship between increasing market concentration and increasing proliferation of specialists in mature industries. The key implication of this theory concerns the effects of concentration on the viability of specialist organisations (those that seek to exploit a narrow range of resources). The theory of density-dependent organisational evolution synthesizes ecological and institutional processes. It holds that growth in the number of organisations in a population (density) drives processes of social legitimatization and competition that, in turn, shape the vital rates. (1) tends to rejuvenate the organisation. (2) tends to make the organisation more aligned to the external environment. (3) tends to increase the competitiveness of the organisation by redefining its core competence. (4) tends to increase the vulnerability of the organisation. (5) tends to make the organisation industry leader by reformulating its niche. 15. Consider the following: “Tata Steel, one of the biggest steel makers in the world, was born in Jamshedpur.” If above passage is true, then it can be concluded that location of Tata Steel has been one of the reasons for its success. 1. The conclusion is false. 2. This is a farfetched conclusion. 3. This is valid conclusion. 1. This is a valid conclusion. 2. The conclusion is contrary to the ideas described in the passage. 3. The conclusion is an internally contradictory. 17. Recently it was reported that Indian textile sector was not doing well. If the ideas contained in the passage are agreed to, then which of the following could be possible reason(s)? 1. All Indian firms are as old as international firms. 2. Indian textile firms are dispersed all over the country, with most of them also having international presence. Instructions for questions 18 and 19: Analyse the following passage and provide an appropriate answer for the questions that follow. Since power is itself a value, forms of influence which include power in their scope are usually themselves forms of power. The king’s mistress, though she has only influence, not power, over the king, may have power over his subjects in the degree of that influence. Forms of influence based on power are themselves forms of power only if the scope of the influence is included within that of the power in question. The king may exercise influence over standards of morality, say, by virtue of his power position, but he does not necessarily exercise power over morality. 18. Which combination of following statements best summarises the idea expressed in the paragraph? 1. Strength of an influence determines its power. 2. Influence always contributes power to the welder of influence beyond the scope of influence. 3. Proximity to authority is itself a source of power. 4. Forms of influence are power only if they can influence behaviour. 19. Which of the following is similar to ideas expressed in the paragraph? (1) A king can influence what dramas are enacted by artists. (2) A king can influence who acts in dramas in his kingdom. (3) A king can indicate the appropriateness of dramas enacted. (4) A king can influence the prices charged from drama groups by actors. (5) A king can influence on what drama audience spend their money. Instructions for questions 20 – 33: Answer the question given below carefully. 20. As man casts off worn-out garments and puts on others which are new, similarly the embodied soul, casting off worn-out bodies, enters into others which are new. Of the following, which one best typifies the argument? 22. Nature lovers are attracted to forests and nature parks. Just look at the number of people visiting the Corbett national park. Which of the following exhibits a pattern of reasoning least dissimilar to the one exhibited in the argument above? (1) Defence personnel who are trained in extremely rigorous procedures often end up as dysfunctional members of the society. Hence if an officer is not trained rigorously, such an officer is more likely to be useful to the society. (2) This machinery has increased the work efficiency of the workers. As a result, some of these workers are surplus to the company. (3) Fleas must thrive in a warm environment. During warm weather my dog suffers from fleas more so than during cooler weather. (4) Cigarette smoking is known to cause lung cancer in some people. However, most victims of lung cancer live in regions where smoking is uncommon. (5) Alcoholics and teetotalers usually appear at the same restaurant at the same time of the day. Therefore, alcoholics and teetotallers must be hungry at the same time. 23. In this era of global capital flows, so much money is now flowing throughout the world that no single country can fight the problem of inflation effectively by tightening its monetary policy. If the above is true, which of the following could be most logically concluded? (1) Changes in cash reserve ratio by Reserve Bank of India will control the rate inflation in India. (2) Countries’ finance ministers have sufficient control over their respective economies. (3) Countries’ finance ministers have insufficient control over their respective economies. (4) Inflation does not matter as long as incomes increase. (5) Citizens should limit their consumption which will reduce the demand of products, thus reducing inflation. 24. Many entrepreneurs try to control the composition of their boards of directors, but more experienced entrepreneurs tend to share control, inviting participation from institutional investors and outside directors. Which option best summarizes the idea that might be guiding experienced entrepreneurs’ behaviour? (1) The experienced entrepreneurs expect experienced directors to monitor the performance of the enterprise and be a sounding board. (2) The experienced entrepreneurs expect the institutional investors to support the opinion of entrepreneurs on all major decisions. (3) The experienced entrepreneurs expect the institutional investors and outside directors to agree to higher remuneration for the board members. (4) Experienced entrepreneurs expect the experienced directors to engage in day-today management of the company. (5) More the number of influential people on board, the easier it is to raise finances. Which of the following, if true, most seriously undermines the author’s contention? (1) True education implies a well-rounded exposure to major subjects. (2) An educated man will not discuss things which he does not understand. (3) The cost of a general education has led to the unfortunate fact that a person’s education is confined to one field. (4) Stupidity, like intelligence, is relative and therefore depends on the intelligence of the persons’ peers. (5) Education is one of the main causes of people recognizing their capabilities and developing them further. 26. Ram, an economist, and Ramesh, an astrologer, had a debate. Ram said “Astrology does not work. It just cannot predict.” “It can predict better than your subject” rebutted Ramesh. (1) Conduct a survey among scientists asking which one of the two should be considered as a science. (2) Compare past performance of astrologers and economists in terms of number of predictions which have come true. (3) Conduct a survey among economists asking their opinion regarding the ability of economic theory to predict economic phenomena. (4) Conduct an experiment where both astrologers and economists would be asked to predict the future. Compare the number of predictions that come true. (5) Conduct an experiment where both astrologers and economists would be asked to predict the future. Compare the percentage of predictions that come true. 27. Which of the following sentences draws a metaphor? (1) Karl Marx argued that the interests of two classes – the proletariat and the bourgeois – are always in conflict and irreconcilable. (2) Karl Marx labelled the capitalist a parasite on the back of labour because the whole value or produce created by the labouring man was expropriated by the capitalist. (3) Weber held that the protestant ethic was responsible for the rise of capitalism in medieval Europe. (4) Galbraith argued for a better balance between private affluence and public poverty, including measures to protect the environment against the excesses of private companies. (5) Schumpeter argued that changes in economy are brought about by creative destruction. 28. Which sentence includes an example of personification? (1) Banjaras of Rajasthan are the human equivalent of an endangered species and have no defence against the encroachment of farmers onto their ancestral lands. (2) Take airline pilots for example; they do not need to be graduates to qualify for this job and most pilots are on a salary of Rs. 300,000 per month or more. (3) Recent research provided stark evidence that in education money still plays an important role; it was found that children from poor households could not perform as well as children from rich households. (4) Girls in the family should have a share in the ancestral property as a matter of right whether the will includes it explicitly or not. (5) Democracy does not help the common citizen and it ultimately degenerates into an oligarchy. 29. Which sentence suffers most from hyperbole? (1) Most collectors of coins would give the Earth to own one of the copper coins issued by Mohammad Bin Tughlaq. (2) It is thought that eating raw tomatoes would greatly reduce the risk of cancer, but tomato sauce can have a greater effect since it is made from many raw tomatoes. (3) Cricket has a great following in India, but the twenty-twenty format took the game to nook and corner of the world. (4) We face an imminent drinking water crisis in India as the population growth is accompanied by a general decrease in rainfall. (5) Nuclear fusion has potential to solve the energy crisis of not only our country, but that of the entire world. 30. Which sentence includes a euphemism? (1) Cell phone network signals are weak in the hilly regions. (2) Bottled water is reputed to be safe for drinking under all circumstances. (3) A cemetery is a place where people are buried when they pass away. (4) It is stupid to cry over split milk. (5) Criminal court arbitrates between the parties to the case. 31. Which of the following contains a non-sequitur? (1) If statisticians are made judges, they will accept or reject arguments based on probability analyses. (2) Public trust in politicians is at an all time low and we can’t insist that the politicians go back to school. (3) Before preparing the annual budget, the CEO of XYZ Steel Limited takes opinion of all the stakeholders. (4) In cricket, the batting average does not always reflect a batsman’s ability because it does not reflect how many wins he was instrumental for. (5) Ordinary citizens do not have sufficient grasp of economic indicators to validate published inflation data. 33. Which sentence includes an oxymoron? (1) On weekend we ate and drank a lot. (2) Meena corrected me by pointing out that she wanted pizza instead of burger. (3) Media reported the attack on media-persons. (4) He loved his aunt but found her kindness suffocating. (5) One should not compare apples and oranges. Instructions for questions 34 and 35: Read the sentences and choose the option that best arranges them in a logical order. 1. The moral will arises when, for the reasons we saw earlier, this negotiation has to be negated; the individual moral will understands that it is the existence of the universal will, which is therefore internal to it. 2. This constitutes a negation, because the individual will is understood not to be the existence of the universal will. 3. This says that in abstract right, as we have just seen, the individual will takes its freedom (the universal will that has being in itself) to exist independent of (that is, in opposition to) itself and its particular contents. 4. Rather, the universal will is thought to exist outside any individual will, in the contracts that bind a number of property-owning wills together, and in the punishments that enforce breaches of those contracts. 1. In the concept, universality, particularity, and individuality are understood as bring immediately identical to each other. 2. As immediately identical, these “moments of the concept” cannot be separated. 3. This means that they must be thought of as a single unity, that none of the three can be understood apart from the others, since in the concept their identity is posted, each of its moments can only be grasped immediately on the basis of and together with the others. 4. The interrelation of universality, particularity, and individuality is otherwise in judgment. 36. In an examination there are 30 questions. 1 mark is given for each correct answer and 0.25 is deducted for every incorrect answer. Ankur attempted all the questions and scored 13.75. How many incorrect answers did he have? 37. A salesman sells two kinds of trousers: cotton and woollen. A pair of cotton trousers is sold at 30% profit and a pair of woollen trousers is sold at 50% profit. The salesman has calculated that if he sells 100% more woollen trousers than cotton trousers, his overall profit will be 45%. However he ends up selling 50% more cotton trousers than woollen trousers. What will be his overall profit? (1) If Statement I alone is sufficient to answer the question. (2) If Statement II alone is sufficient to answer the question. (3) If Statement I and Statement II together are sufficient but neither of the two alone is sufficient to answer the question. (4) If either Statement I or Statement II alone is sufficient to answer the question. (5) Both Statement I or Statement II are insufficient to answer the question. 38. For each rupee in monthly advertising expenditure, KUMAR & Co. experiences a Rs. 6 increase in sales. How much KUMAR & Co. has to spend on advertising to attain Rs. 1000000 in sales revenue for the month? I. Without advertising KUMAR & Co. earns Rs. 200000 sales revenue per month. II. When KUMAR & Co. spends Rs. 15000 on advertising, it earns Rs. 290000 as sales revenue. ∴ sb can be calculated easily. So we can answer using statement II alone. 39. Geetanjali Express, which is 250 metre long when moving form Howrah to Tatanagar crosses Subarnarekha bridge in 30 seconds. What is the speed of Geetanjali Express? I. Bombay Mail, which runs at 60 km/hour crosses the Subarnarekha bridge in 30 seconds. II. Bombay Mail when running at 90 km/hr crosses a lamp post in 10 seconds. 40. Rajesh walks to and fro to a shopping mall. He spends 30 minutes shopping. If he walks at speed of 10 km an hour, he returns to home at 19.00 hours. If he walks at 15 km an hour, he returns to home at 18.30 hours. How fast must he walk in order to return home at 18.15 hours? (a) You can have tomato sauce if you have an egg, but not if you have a mutton roll. (b) If you have onion or tomato or both you can have chilli sauce, but not otherwise. How many different rolls can be ordered according to these rules? 42. Given five points A = (7, 4), B = (−10, 0), C = (−10,3), D = (0, 10) and E = (7, 7). Every second all the points move by halving their abscissas and by doubling their ordinates. This process continues for 500 years. After 500 years, which two points are closest? Instructions for questions 43 and 44: Answer the following questions based on the information given below. 43. Which of the following conclusions can be made? (1) Producer’s margin for panir kachouri is less than retailer’s margins. (2) Producer’s margin for chicken pizza is more than retailer’s margins. (3) Producer’s margin for fish spring roll is more than retailer’s margins. (4) Producer’s and retailer’s margins are highest for panir kachouri alone. (5) Retailer’s made losses in a few products. 44. Which of the following conclusion can be drawn from diagram above? (1) Retailers’ selling price for mistisukh was more than producer’s selling price for chicken titbit. (2) Difference between retailer’s selling price and producer’s selling price for fish kachouri was more than that of cream roll. (3) These are three types of margins for all items. 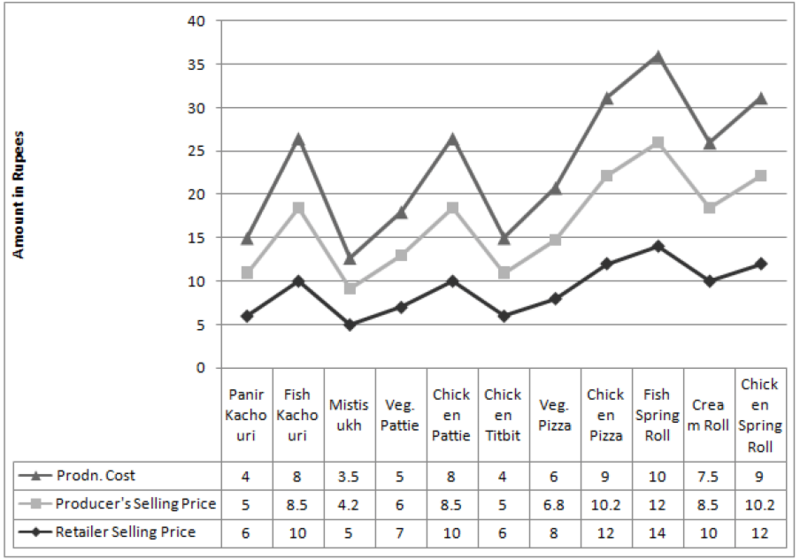 (4) Of all the margins, both for retailer and producer, producer’s margin for chicken pizza was the maximum. (5) The three lines that connect different points, in the diagram above, are superfluous. 45. Mungeri Lal has two investment plans- A and B, to choose from. Plan A offers interest of 10% compounded annually while plan B offers simple interest of 12% per annum. Till how many years is plan B a better investment? 47. Two teams Arrogant and Overconfident are participating in a cricket tournament. The odds that team Arrogant will be champion is 5 to 3, and that Overconfident will be the champion is 1 to 4. What are the odds that either team Arrogant or team Overconfident will become the champion? 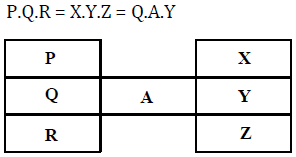 Instructions for questions 48 – 50: Answer the questions based on the following table. A cake chain manufactures two types of products – ‘cakes/pastries/gateaux’ and savouries. The chain was concerned about high wastage (in terms of leftover) and wanted to reduce it. Table 1 provides information about sales, costs and wastage for both products. 48. Which of the following statement(s) is (are) right? 1. The worth of leftover for cakes/pastries/gateaux increased from 1993 to 2004. 2. The worth of leftover for cakes/pastries/gateaux, kept on fluctuating, many a times, between 1993 and 2004. 3. The worth of leftover for savouries and cakes/pastries/gateaux was highest in 2004. 4. The worth of leftover for savouries kept on fluctuating, many a times, between 1993 and 2004. (4) There was always an increase in worth of leftover. (5) Cannot be calculated from the data. 50. 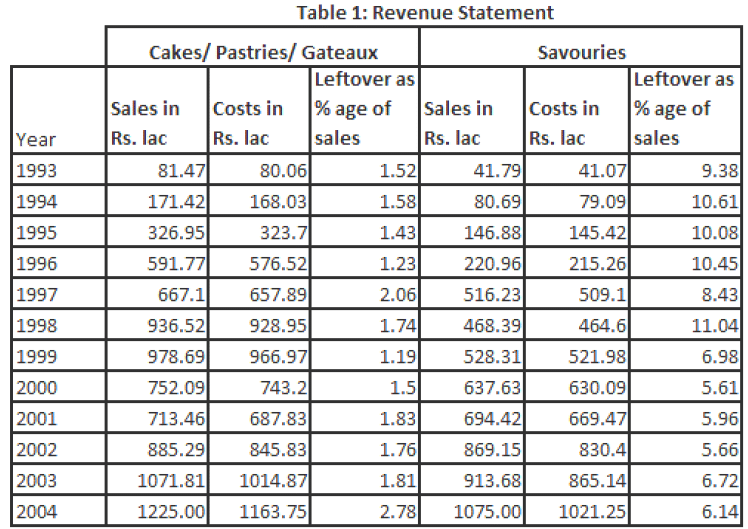 If profit = sales – cost – leftover, in which year did the cakes chain was in losses? (5) It was always in profit. Instructions for questions 55 and 56: Answer the following questions based on the information given below. 60. How many differently shaped triangles exist in which no two sides are of the same length, each side is of integral unit length and the perimeter of the triangle is less than 14 units? Instructions for questions 62 – 64: Answer the following questions based on the information given below. KK, an aspiring entrepreneur wanted to set up a pen drive manufacturing unit. Since technology was changing very fast, he wanted to carefully gauge the demand and the likely profits before investing. Market survey indicated that he would be able to sell 1 lac units before customers shifted to different gadgets. KK realized that he had to incur two kinds of costs – fixed costs (the costs which do not change, irrespective of numbers of units of pen drives produced) and variable costs (= variable cost per unit multiplied by number of units). KK expected fixed cost to be Rs. 40 lac and variable cost to be Rs. 100 per unit. He expected each pen drive to be sold at Rs. 200. 62. What would be the break-even point (defined as no profit, no loss situation) for KK’s factory, in term of sales? (5) Cannot be found with the given data. 63. KK was sceptical that per unit variable might increase by 10% though the demand might remain same. What will be the expected changes in profit in such a case? 64. He discussed his business with a chartered accountant. KK informed that he was contemplating a loan of Rs. 20 lac at simple interest of 10% per annum for starting the business. The chartered accountant informed him that in such a case KK has to pay interest, followed by 30% tax. By how much does KK’s earnings change with 20% growth in sales vis-à-vis the original sales volume, in both cases considering tax and interest on loan? 65. Let X be a four digit number with exactly three consecutive digits being same and is a multiple of 9. How many such X’s are possible? Instructions for questions 66 and 67: Answer the following questions based on the information given below. A police inspector spots a thief standing 7 km away from him on a straight road aligned in East-West direction. The inspector is standing on the eastern side while the thief is on the western side of the road. On spotting the inspector the thief takes his bicycle and tries to cut across the adjoining field by riding away with a uniform speed of 9√2 km/hour in a direction making an angle of 45° with the road towards North-East. The inspector starts with his scooter at the same instance to move with a uniform velocity15 km/hour and catches the thief. Instructions for questions 68 to 72: Answer the following questions based on the information given below. Sodium carbonate, also called as soda ash is an important ingredient for glass, soaps and detergents, and many other products. There were two ways of producing soda ash. The first is producing soda ash from trona obtained naturally. The second method was producing soda ash from common salt through Solvay process. Soda ash produced thus was called synthetic soda ash. Tata Chemicals was one of largest producers of soda ash. 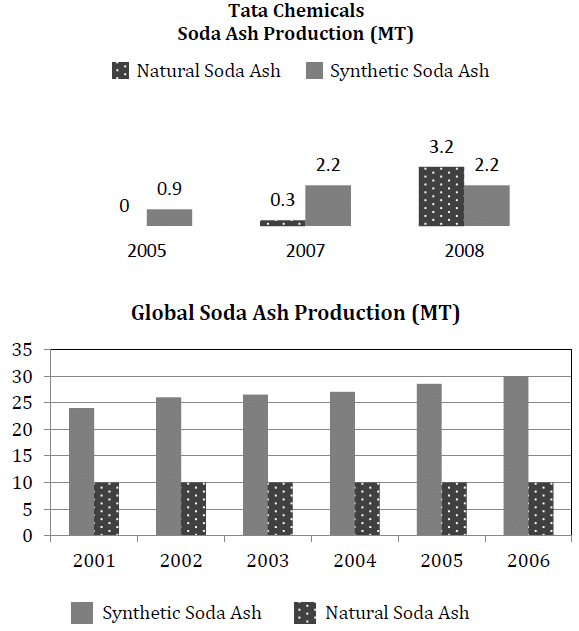 Given below are two charts- first chart shows production of two varieties of soda ash in the world. 68. It was expected that global soda ash production would be same for 2006, 2007 and 2008 (only for this question). What could be a possible reason for different patterns of production in Tata Chemicals and the world? (1) Tata Chemicals build new plants of 2.2 MT natural soda ash capacity in 2007. (2) Tata Chemicals build 3.2 MT of natural soda ash capacity from 2005 to 2008. (3) Tata Chemicals produced 2.7% of total soda ash in the world. (4) Tata Chemicals might have acquired 0.3 MT of natural soda ash facility in 2007. 69. Suppose the total global production increased (year on year) from 2005 to 2008 by the amount Tata Chemicals’ synthetic production (year on year) increased in the same period. By what percentage did the total global production increase from 2007 to 2008? (1) Cannot be calculated at all from the tables above. (4) Did not increase at all. 70. Which of the following statements are true? 1. Proportion of natural soda ash to synthetic soda has decreased from 2001 to 2006 globally. 2. Proportion of natural soda ash to synthetic soda ash has increased from 2001 to 2006 globally. 3. Proportion of synthetic soda ash to total soda ash has decreased for Tata chemicals from 2005 to 2007. 4. Proportion of synthetic soda ash to total ash has increased for Tata chemicals. 71. What is Tata Chemicals’ share of global production in 2008? 72. Suppose total global production of soda ash in 2008 was 40 MT and Tata Chemicals was second highest producer of soda ash globally after another company called Solvay. FMC Wyoming was the third highest producer. Two Indian giants, Tata Chemicals and Nirma have a combined production capacity of 8.8 MT. Which of the following statements are right? Instructions for questions 74 – 76: Answer the following questions based on the information given below. Four married couples competed in a singing competition. Each couple had a unique team name. Points scored by the teams were 2, 4, 6 and 8. The “Sweet Couple” won 2 points. The “Bindas Singers” won two more points than Laxman’s team. Mukesh’s team won four points more than Linas’s team, but Lina’s team didn’t score the least amount of points. “Just Singing” won 6 points. Waheda wasn’t on the team called “New Singers”. Sanjeev’s team won 4 points. Divya wasn’t on the “Bindas Singers” team. Tapas and Sania were on the same team, but it wasn’t the “Sweet Couple”. Instructions for questions 77 – 80: Answer the following questions based on the information given below. The regular mathematics faculty could not teach because of being sick. As a stop gap arrangement, different visiting faculty taught different topics on 4 different days in a week. The scheduled time for class was 7:00 am with maximum permissible delay of 20 minutes. The monsoon made the city bus schedules erratic and therefore the classes started on different times on different days. 7:10 am. No two classes started at the same time. (1) 7:05 am and topic was ratio and proportion. (2) 7:20 am and topic was calculus. (3) 7:00 am and topic was calculus. (4) 7:30 am and topic was calculus. (5) 7:05 am and topic was probability. Instructions for questions 81 – 85: Answer the following questions based on the information given below. Five people joined different engineering colleges. Their first names were Sarah (Ms.), Swati (Ms.), Jackie, Mohan and Priya (Ms.). The surnames were Reddy, Gupta, Sanyal, Kumar and Chatterjee. Except for one college which was rated as 3 star, all other colleges were rated either 4 star or 5 star. College” was a five-star college. Swati’s last name wasn’t Chatterjee. The “Chemical College” was rated with one star less than the college where Sanyal studied. Only one college was rated five star. 81. Which is the correct combination of first names and surnames? 82. Which option gives a possible student – institute combination? 84. In which college did Priya study? Decisions are often ‘risky’ in the sense that their outcomes are not known with certainty. Presented with a choice between a risky prospect that offers a 50 percent chance to win $200 (otherwise nothing) and an alternative of receiving $100 for sure, most people prefer the sure gain over the gamble, although the two prospects have the same expected value. (Expected value is the sum of possible outcomes weighted by their probability of occurrence.) Preference for a sure outcome over risky prospect of equal expected value is called risk averse; indeed, people tend to be risk averse when choosing between prospects with positive outcomes. The tendency towards risk aversion can be explained by the notion of diminishing sensitivity, first formalized by Daniel Bernoulli in 1738. Just as the impact of a candle is greater when it is brought into a dark room than into a room that is well lit so, suggested Bernoulli, the utility resulting from a small increase in wealth will be inversely proportional to the amount of wealth already in one’s possession. It has since been assumed that people have a subjective utility function, and that preferences should be described using expected utility instead of expected value. According to expected utility, the worth of a gamble offering a 50 percent chance to win $200 (otherwise nothing) is 0.50 * u($200), where u is the person’s concave utility function. (A function is concave or convex if a line joining two points on the curve lies entirely below or above the curves, respectively). It follows from a concave function that the subjective value attached to a gain of $100 is more than 50 percent of the value attached to a gain of $200, which entails preference for the sure $100 gain and, hence, risk aversion. Consider now a choice between losses. When asked to choose between a prospect that offers a 50 percent chance to lose $200 (otherwise nothing) and the alternative of losing $100 for sure, most people prefer to take an even chance at losing $200 or nothing over a sure $100 loss. This is because diminishing sensitivity applies to negative as well as to positive outcomes: the impact of an initial $100 loss is greater than that of the next $100. This results in a convex function for losses and a preference for risky prospects over sure outcomes of equal expected value, called risk seeking. With the exception of prospects that involve very small probabilities, risk aversion is generally observed in choices involving gains, whereas risk seeking tends to hold in choices involving losses. Based on above passage, analyse the decision situations faced by three persons: Babu, Babitha and Bablu. 86. Suppose instant and further utility of each unit of gain is same for Babu. Babu has decided to play as many times as possible, before he dies. He expected to live for another 50 years. A game does not last more than ten seconds. Babu is confused which theory to trust for making decision and seeks help of a renowned decision making consultant: Roy Associates. What should be Roy Associates’ advice to Babu? (1) Babu can decide on the basis of Expected Value hypothesis. (2) Babu should decide on the basis of Expected Utility hypothesis. (3) “Mr. Babu, I’m redundant”. 87. Babitha played a game wherein she had three options with following probalilities: 0.4, 0.5 and 0.8. The gains from three outcomes are likely to be $100, $80 and $50. An expert has pointed out that Babitha is a risk taking person. According to expected utility hypothesis, which option is Babitha most likely to favour? (4) Babitha would be indifferent to all three actions. 88. Continuing with pervious question, suppose Babitha can only play one more game, which theory would help in arriving at better decision? (3) Both theories will give same results. (4) None of the two. (5) Data is insufficient to answer the question. (1) Bablu is risk taking. (2) Expected value function is concave. (3) Expected value function is convex. (4) It does not matter which option should Babu choose. Instructions for questions 90 – 94: Answer the following questions based on the information given below. A circular field, with inner radius of 10 meters and outer radius of 20 meters, was divided into five successive stages for ploughing. The ploughing of each stage was handed over to a different farmer. 1. Farmers are referred to by following symbols: F1, F2, F3, F4, F5. 2. The points between different stages of project are referred to by the following symbols: P1, P2, P3, P4, P5, not necessarily in that order. 3. Farmer F5 was given the work of ploughing stage starting at point P4. 4. The stage from point P5 to point P3 was not the first stage. 5. Farmer F4 was given the work of the fourth stage. 6. Stage 3 finished at point P1, and the work of which was not given to farmer F1. 7. Farmer F3 was given work of stage ending at point P5. 90. Which was the finish point for farmer F2? 91. Which stage was ploughed by farmer F5? 92. Which were the starting and finishing points for stage 2? 93. For which farmer was P2 a finishing point? 94. Which was the starting point for farmer F3? 95. Children are in pursuit of a dog whose leash has broken. Krishnarajan is directly behind the dog. Rangarajan is behind Krishnarajan. Natrajan is behind Rangarajan. Premrajan is ahead of the dog walking down the street in the opposite direction. As the children and dog pass, Premrajan turns around and joins the pursuit. He runs in behind Rangarajan. Krishnarajan runs faster and is alongside the dog on the left. Rangarajan runs faster and is alongside the dog on the right. Which child is directly behind the dog? Om Chowdhury was one of the supervisors in the Fire and Safety (F&S) department of Maqsood Textile Mills. He was distant cousin to Mr. Bhiwani, General Manager (Personnel & Administration). Personnel & Administration department was given the responsibility of all personnel related decisions. It was often rumoured that Om had obtained the job due to his cousin’s influence. However, Om was meticulous in the performance of his duties and didn’t give anyone reason for complaint. It was known that Om was not much given to talking and kept to himself and to his duties All F&S supervisors reported to Mr. Rabindra, the shop-floor manager. The mill operated on a threeshift basis and Rabindra allocated the supervisors to different shifts. They were required to be present at all times during the shift operation and carry out scheduled checks on of machinery and fire fighting equipments. For some reasons, Om was allocated the night shifts more often than other supervisors. Om accepted these allocations without any objection, while it was known that other supervisors would often plead and bargain with Rabindra to be allocated the day shifts. During the night shift, keeping awake and remaining mentally alert were some of the major challenges faced by the supervisors. Of late, Rabindra observed signs of indifference from Om. On two occasions he found Om absent from his cabin. Rabindra heard from others that Om was often found in different parts of shop floor talking to employees. Rabindra called him to his office and reminded Om of his responsibilities. Om did not counter Rabindra. He promised that he would not be lax in his duties again. Rabindra also broached the subject with Mr. Bhiwani. Mr. Bhiwani called Om to his office and talked on a very personal basis. He reminded Om that their family relations made it uncomfortable to all concerned. Om nodded and agreed to do better. Soon his performance became that of a model supervisor. It was often found he went beyond his official duties to sort out problems of employees. About three month later, Rabindra happened to visit the plant during night. As he looked into F&S office, he found Om playing solitaries on the office computer. Mr. Rabindra immediately fired Om. The next morning Mr. Bhiwani called Mr. Rabindra and asked how he can fire an employee. He suggested that Mr. Rabindra reconsider Om’s dismissal. “This decision has already been made. There will be no turning back” replied Rabindra. 97. The options below give combinations of possible root cause of the problem and the justifications thereof. Given the details in the case, which one can be inferred to be the best option? (1) Hiring of Om. Reason: That ensured Om was perpetually casual towards his duties. (2) Om favouring to work during night shift. Reason: Absence of Rabindra ensured that Om could relax. (3) Rabindra’s bias against Om. Reason: Rabindra had been assigning too many night shifts to Om while for other supervisors he was lenient. (4) Rabindra jumping to conclusions. Reason: He should have investigated whether Om had carried out his duties. (5) Rabindra’s firing of Om. Reason: It led to clash between Rabindra and Mr. Bhiwani. 98. The details of the entire episode have become common knowledge among all the employees of the company. Out of options below, which one presents the best way for the top management to resolve the issue so as to benefit the organization as a whole? (1) Revoke Rabindra’s order. It can be communicated to others that firing was too severe a punishment for such a small incident of indiscipline. (2) Ask Om for clarification. It can be communicated that since Om had clarified regarding his duties, the order has been taken back. (3) Declare Rabindra’s order as void. Reiterate officially the disciplinary processes that need to be followed by managers along with their scope of authority. (4) Ask feedback from other employees on the shop-floor regarding Om’s performance. This can be used to revoke Rabindra’s order. (5) Take the feedback of other F&S supervisors as to the work involved during night shift. This would better explain Om’s behaviour. 99. Out of options below, which one best summarizes the learning from solitaire incident? (1) Managers often do not take any responsibility towards training juniors. (2) People tend to become relaxed during night shift and required surprise checks to keep them on their toes. (3) Certain roles would have different ways of carrying out their duties. (4) Having relatives in the same organization can be a source of potential problems. (5) Managers tend to allocate silent people to different positions. 100. Of the options below, which could have been a better response from Mr. Ravindra when he saw Om playing? (1) He should have clarified about his authority to fire employees. (2) He should have informed Mr. Bhiwani about the incident and asked him to take necessary action. (3) He should have asked the employees of the shift regarding Om’s performance of his duties. (4) He should have checked if Om had done his duties or not. (5) He should have checked the production levels in the shift to see if it was as required. Shekhar, an MBA from Singapore returned to his hometown- Jamshedpur. Jamshedpur had a population of 10 lacs with one of the highest per capita income among India cities. Shekhar loved music. While listening to his favourite song on “satellite radio”, he wondered if he could mix his passion with business. Incidentally, a few weeks later, while browsing the Internet, he came across an advertisement from Music World, which called for expression of interest from potential franchisees. Jamshedpur did not have a single good music outlet, where its residents could buy quality, variety and the latest from the world of music. Music world wanted the potential franchisees to own minimum 1200 square feet space and invest Rs.30 lacs. Profits were to be shared in the ratio of 3:7 between Music World and the franchisee. While Shekhar was excited about working with a renowned brand, he was worried if Rs. 30 lacs was too high an amount to shell out. He did not have the entire amount with him and was thinking of borrowing from the bank. He made enquiries with other Music World franchisees located in towns like Patna and Ranchi, as he expected similar footfall in Jamshedpur. A franchisee in Patna had sales revenue varying from 1-2 lacs rupees per month with profit margin in the range of 25-30%. Satisfied, Shekhar decided to proceed. Soon, he was on a look out for the space. Jamshedpur had three main areas – Bistupur, Sakchi and Sonari. All areas were inter-connected by good roads. Bistupur was a business area where most of high end retail formats were located. Most upper middle class and higher class customers shopped there. It was also the education hub of the city. On the other hand, Sakchi was a growing lower middle class business area and Sonari had mostly residential population. Shekhar was in favour of choosing Bistupur as it was the place where he shopped. However, he soon stumbled across problems. Not only it was difficult to obtain space in Bistupur but property rentals touched 30-40 rupees per square feet month. Rentals at Sakchi and Sonari were in the Range of 15-20 rupees per square feet per month. Also, Shekhar’s friend, who stayed in Sakchi, told him that a few branded outlets were opening in Sakchi and it seemed to be the fastest growing market in Jamshedpur, with highest ratio of teenagers. But, Shekhar was not in favour of Sakchi due to its low image. He expected to target college going crowd in Bistupur. High real estate prices in Bistupur and his low assessment of Sakchi market created confusion in Shekhar’s mind. To give the decision a serious and fresh thought, he decided to hit Jamshedpur-Ranchi highway in his newly acquired car. 101. How best should Shekhar resolve his confusion? (2) Do not invest in the franchise and look for different brand name. (3) Go back to Singapore and start looking for a job. (4) Do a further in–depth study to find the drivers and potential of the business. (5) Approach another music company for setting up a franchise. 102. Suppose sales in Patna ad Bistupur are likely to be same, how many years would it take for Shekhar to recoup the investment (consider zero inflation)? (1) Less than five years. (2) Less than seven years. (3) Less than eight years. (4) Less than nine years. 103. What could be the most likely reason for Shekhar’s bias in favour of Bistupur? (1) Presence of college going crowd, as he felt they were the customers for the latest music. (2) Crowded (hoi polio) image of Sakchi. (3) It was difficult for Shekhar to associate non – Bistupur areas with good quality products. (4) Higher rentals in Bistupur. (5) Patronage of Bistupur shops by executive and their families. 104. Which one of the following is the most important decision criterion is such a business situation? (1) Financial capability of entrepreneur. (2) Changes in music industry. (4) Profitability of business in first couple of years.